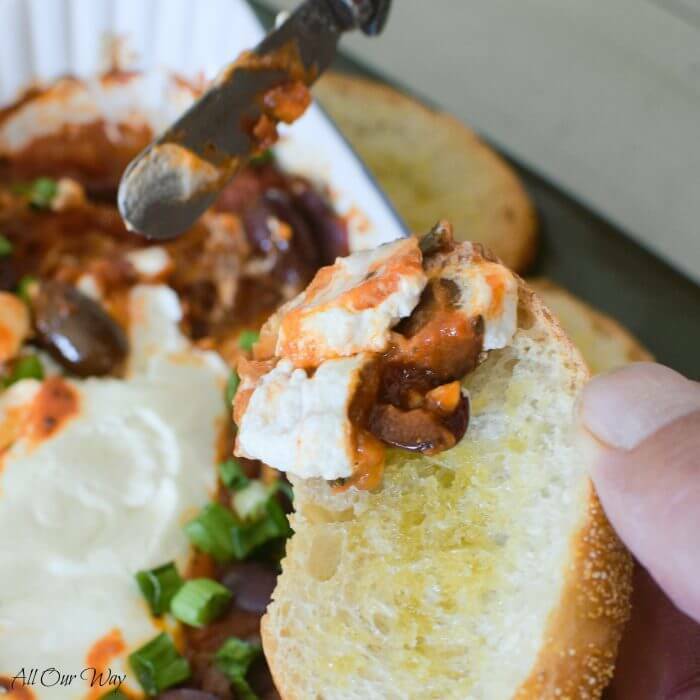 Baked Goat Cheese Marinara Dip is a deliciously gooey zippy appetizer that takes almost no time at all to make. Think of warm earthy goat cheese surrounded by a robust, spicy marinara sauce. This Italian sauce has chunky vegetables, roasted garlic, and lots of herbs. To further enhance the taste, we added kalamata olives and caramelized onion. The beauty of this goat cheese recipe is that you can use your marinara sauce or your favorite jarred variety. This hot goat cheese appetizer is one your friends and family will insist you make frequently. And of course, you’ll be happy to comply because it’s super easy. Crostini or breadsticks make ideal scoops for the dip. For this recipe, you will need goat cheese, marinara sauce, kalamata olives, garlic, large onion, fresh basil. What type of goat cheese? Chevre means goat but we regularly use the term to mean goat cheese, especially the softer variety. There are two classifications of goat cheese. Unripened which is fresh, soft, and creamy. It represents most of the domestic cheese production. This cheese is ready to eat in just a few days. It has a tang and is very moist; it’s similar to ricotta cheese. Ripened cheese ages for about three to four months. The texture indicates the moisture content of the cheese and further classifies them as soft, semisoft, firm or hard. For our baked goat cheese marinara dip, you will need soft, unripened variety. We got our goat cheese in a double pack at a big box store. It was very economical, and I was curious to find all the recipes that feature soft goat cheese. I was amazed at the number of dishes and believe me; my mouth was watering by the time I finished reading. Scrambled Eggs with Caramelized Onions and Chèvre. Do any of those recipes tempt you? They sure do me! Roasted Beet and Goat Cheese salad is a staple in many restaurants. As you can see above, goat cheese can also be an ingredient in desserts. Instead of cream cheese in frostings, how about using goat cheese? Not only does goat cheese taste delicious but it’s also good for you. Is Goat Cheese Lactose-Free? No, it’s not. But the good news is that goat’s milk may be more digestible than cow’s milk because the fat molecules are shorter than those in cow’s milk. Cheese is sometimes easier to digest than milk because the aging process reduces lactose. The longer a cheese ages, the more lactose turns to lactic acid. Does Goat Cheese Have Casein? Sometimes a milk allergy has nothing to do with lactose; the culprit could be casein. Goat’s milk does have this protein but less than cow’s milk. Some people with milk allergies may be able to tolerate goat cheese. So for people who thought they couldn’t have cheese because they suffer from milk allergies, eating longer-aged cheese might be the solution. is lower in fat than cow cheese. has fewer calories than cow cheese. is lower in sodium than cow cheese. is rich in vitamins, calcium, and minerals. Goat cheese is very prevalent in the Mediterranean region where cows are less common there. The soft unripened cheese makes a wonderful spread to slather on crostini or bruschetta. It pairs well with products found in the Mediterranean area. Delicious ingredients such as olives, rich olive oils, tomatoes, herby pesto, mushrooms, and garlic. There’re so many types of goat cheese that it’s difficult to specify a wine to go with it. A wine that we enjoy is sauvignon blanc and it’s excellent with our soft goat cheese. You may want something with a bit more body like a pinot noir with the baked goat cheese appetizer. We’re sure you will love this dip with caramelized onions. This is a smooth, creamy, and herbal soft cheese that you’ll want to slather on all your favorite toasted bread, crackers, or even breadsticks. 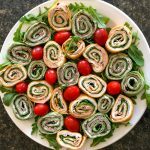 The appetizer looks fussy but it is so easy you’ll want to keep the three main ingredients on hand all the time to throw together when the mood hits. 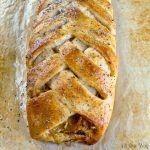 We did add caramelized onion to it and you can also opt to put in a roasted head of garlic. Our marinara sauce had plenty of garlic so we just added the onion. This is a smooth creamy, herbal soft cheese that is surrounded with spicy marinara sauce. The soft gooey cheese is delicious slathered on toasted bread, breadsticks, or crackers. This is a quick and easy recipe that you'll want to make again and again. In a large skillet melt the butter and olive oil. Add the thinly sliced onion and slowly caramelize them. They will turn a rich golden brown -- be careful not to burn. Set aside. Preheat oven to 400 F. Peel and discard the papery outer layers of the whole garlic bulb. Cut off 1/4 to 1/2 inch from the top of the garlic exposing the individual cloves of garlic. Make sure the individual cloves of garlic are exposed. Place the garlic heads cut side up on a piece of foil. Drizzle olive oil over the garlic then crimp the foil edges to seal. Bake for 30-35 minutes, or until the cloves feel soft when pressed. In a gratin dish or any oven-proof serving dish, place the cheese in the center and press down, leaving edges around the cheese. Add the caramelized onion and squeeze the roasted garlic into the marinara sauce. Mix well. Pour the marinara sauce around the goat cheese. Sprinkle the kalamata olives on the sauce. Bake for 30-35 minutes. Sprinkle the dip with basil ribbons. Serve warm with toasted crostini, breadsticks, or crackers. Note: Recipes and content from © 2014 – 2018 are copyright protected. Please do not use content or recipe without prior written permission. If you want to share the information, please link to this post. Grazie. This is the kinda dip I would serve to our guests for our Christmas party! 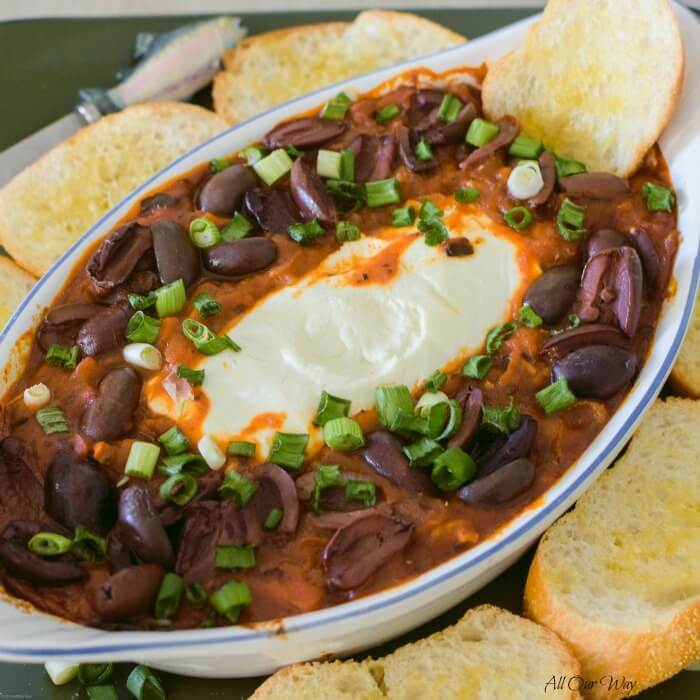 I love the creamy goat cheese with the olives, and the sauce – uh yes please! It is so different than anything I have done before too, which is always nice! I love recipes that take no time (almost). I guess I am at the stage of life when I need to do thinks quick because there is so much to do! 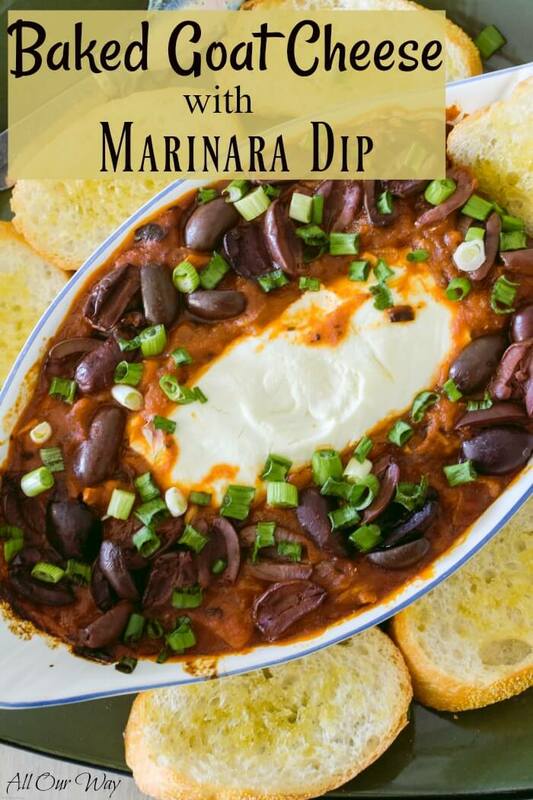 Definitely trying this baked goat cheese marinara dip now! You have two of my favorite things in this dip, goat cheese and caramelized onions. This over crostini and a side salad would be perfect for dinner. This is a gorgeous dip! I know my family and friends would salivate if I put this in front of them – can’t wait to try! The addition of the caramelized onion is brilliant. Definitely a recipe to try for our next get together. Caramelized onions make everything better, doesn’t it? I am totally drooling over this goodness! Yum! This is on my list for the holidays! I love olives in anything and the flavor combinations sound out of this world! OH! I know what I’m eating on Black Friday! _ I’m not a shopping hound, so I used that day to cook and bake and this will be perfect for snacking on all afternoon! Mmmm, this looks so good. I think this is a great holiday idea! I will have to give this recipe a try. this sounds so delicious with the marinara. 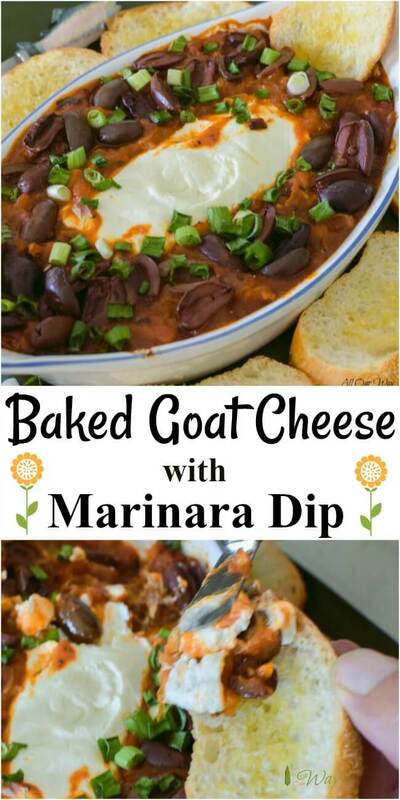 Goat cheese is a fav of mine not so much for the rest of the family so I could make this for myself for sure and love it great idea for a dip! Quickly and easily, that’s what I love! Your recipe is perfect for me. Beautiful presentation and I’m 100% sure that it is very tasty. I can not wait to try. Thanks! Marisa, this looks fabulous! I know it would go over big at any party. And thanks for all the info about goat cheese; I learned a lot. That is pure comfort food!! I love goats cheese and I can have it on toast for breakfast. Love how easy this is to make. Can’t wait to try it. yum! WoW, this looks so dreamy! I’m going to make it for my birthday party next weekend! I am drooling over this recipe as I am a huge fan of cheese, especially goat cheese. I love that you have added the health benefits of goat cheese. We forget that cheese can be good for us and thank goodness because it is delicious. I am looking forward to trying this with one of your pairings, pinot noir. Each time i buy goat cheese from our local Costco, it comes in double package. We usually eat one right away and i leave the the second package for later. Oh, i am so glad i found this Marinara dip! 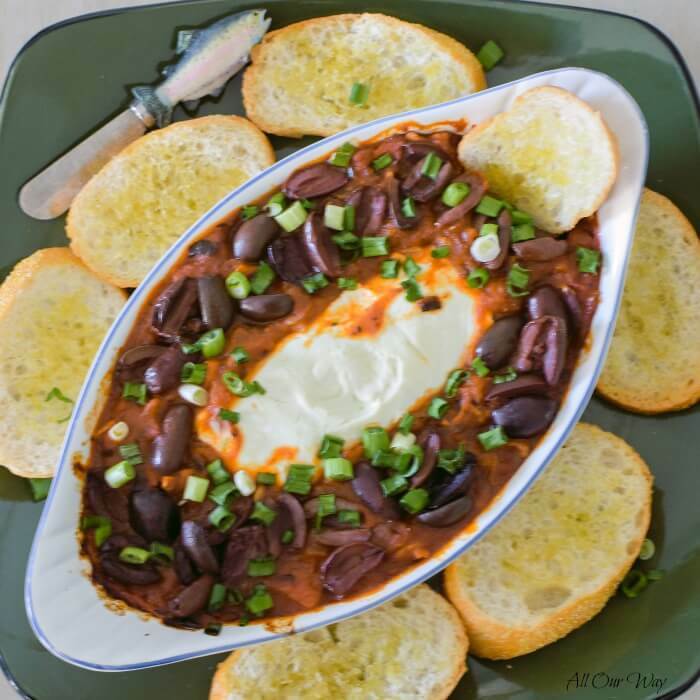 Perfect for leftover goat cheese and perfect for a party! This is SUCH an amazing appetizer! 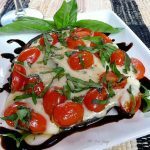 The first time I had it was at a restaurant in my town and while I am a huge goat cheese lover, I never could’ve imagined how delicious it is baked like this with marinara! I wanted to order the whole thing as my dinner! haha. So great to be able to make it at home. Oh, my, what a combination of flavors! And yes, so easy to keep everything on hand and pull it together quickly. 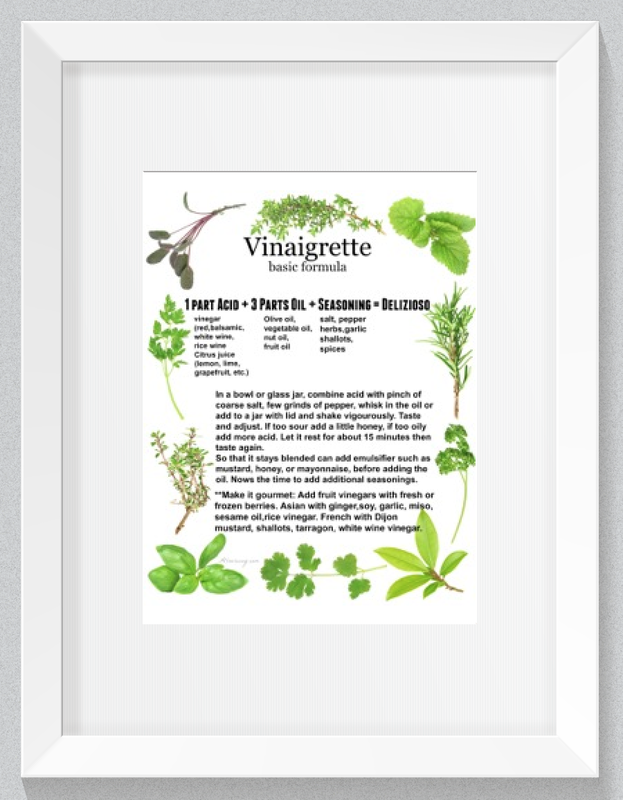 I’m going to have to make this for the family sometime, as a special treat… they’ll love it. First, thank you so much for the education about goat cheese. Now , I know why some of them don’t spread very well. I usually just grab one without reading if it’s ripened or unripened. Second, thank you for this amazing recipe. My family has been asking if we can have “happy hour” on Friday nights instead of regular dinner. (We will not be serving alcohol to minors, so don’t worry.) I’ve pinned this recipe on a list to pull from when I’m trying to plan our menu for the Friday Night Happy Hours. Hi, Patti! I love sharing great recipes and I know you and the kiddos will love it. Happy Friday night! 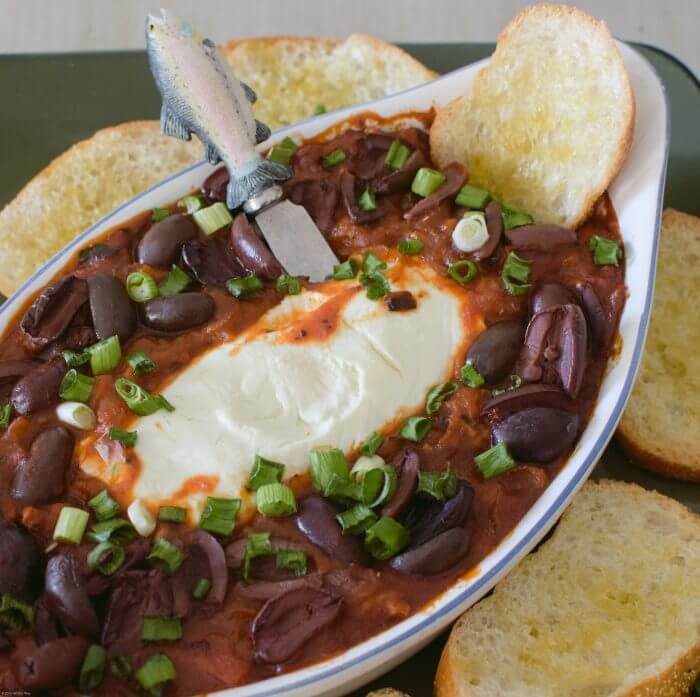 i love love love goat cheese…and this dip sounds fantastic! I absolutely adore goats cheese. I can eat it every day and this would make a meal for me. Perfect to serve when you have guests or even when you just want a light meal. We always have goat cheese in this house, so now I know what it’s going toward next – THIS! This looks delicious. I could make a meal out of this! You’re speaking my language with that creamy goat cheese. It’s my #1 favorite cheese, especially warm and spread over bread! Oh wow wow wow… goat cheese, marinara and caramelized onions…all of my favorite things in one dip. I would LOVE some of this with my lunch right about now. This sounds positively decadent. I would be leery of making this for fear of eating the whole thing myself! Well I can live on goat cheese! There is not a meal in the day that you can’t use it on. If I could only bring 3 things on an island to eat…cheese, bread and wine are my picks. This would be perfect!! What a great party dish. Oh my gosh! This looks so tasty. I love goat cheese, especially the chevre variety. What a great idea to combine these wonderful flavors into a dip. I’m going to pin this recipe for later. Thank you, Michelle! It is so good and so easy!! A lovely appetizer that you can use any time of the year. Lots of delicious ingredients in the sauce. Thank you, Jovina! It really is so good and easy!Hope you give it a try. Hi Marisa, Sorry it’s been awhile since my last contact…..crazy busy at my end….Anyway, I saw your video making above recipe….Looks delicious and can’t wait to try it…..love all your recipes and videos…..
Easter was SPECIAL for us because of grandsons…..Lots of fun with egg hunts, decorating and Easter baskets. Now, it’s continued baseball two and three nights a week. Have a great day.😊. Hi and love to all for us😀😀😀. Again, thank you for all the delish recipes and videos…. Hi, Susie!! I bet you were busy! We’re going to have to have another long chat. Sending lots of love and hugs.